Schuyler C. Baldwin - 1880 ca. Looking southwest, the church at the far left, at the corner of East Park and Park, is First Congregational (now Park Congregational) . The tree covered area to its right is Court House Square, later Fulton St. Park, and today Veterans Park. The roof of the gazebo in the center of the park is visible above the trees. 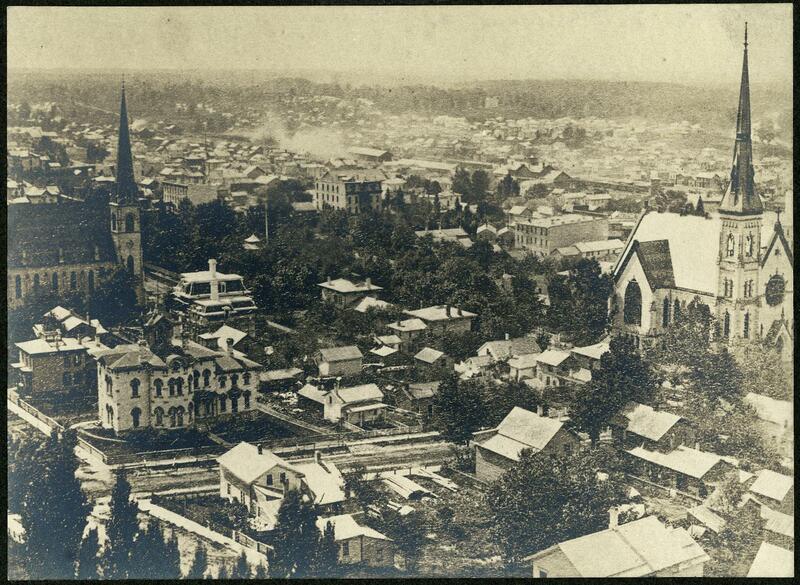 The church at the far right is Fountain St. Baptist Church, at the corner of Fountain and Bostwick. The large Italianate house at the SW corner of Ransom and Fountain (lower left) was the home of Elias Matter of the Nelson, Matter Furniture Co. in 1872. The large house across from the steeple-corner of Park Church was built in 1880-1881 for Darwin D. Cody. The back of the photograph, originally in the collection of Charles E. Belknap, indicates the image was taken from the tower of the High School, which was located in the block bounded by Ransom, Lyon, and Barclay streets. The block occupied by the Elias Matter and Darwin D. Cody homes is now the location of the Grand Rapids Public Library and its parking lot.